Duke City Rep grew just like the wild primrose of the New Mexico desert, with simple resources and a strong will to flourish. 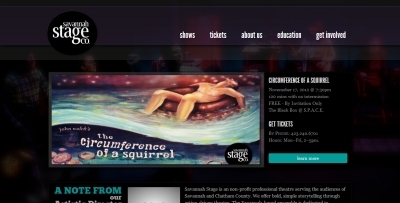 The website showcases their willingness to think out-of-the-box in order to make their art happen. As the product changes, so changes the website. A greater focus goes to the youthful energy and extreme flexibility of the company's productions and operations, and more emphasis is placed on the touring arm of the organization. SSC came to me with very specific content and style preferences which proved a very rewarding challenge. This project was a wonderful opportunity to explore how to find variety and contrast within a predominantly dark website. 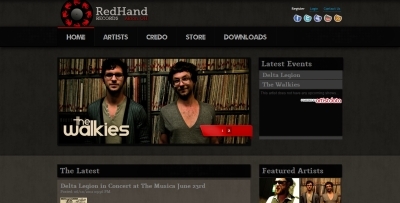 Their former website, now offline. 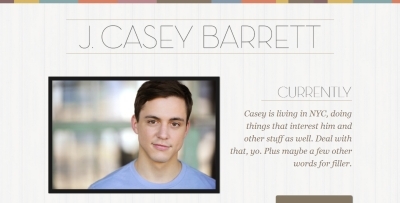 Casey wanted a contemporary, modern and clean site, and a big requirement was that it represent his personality and character. 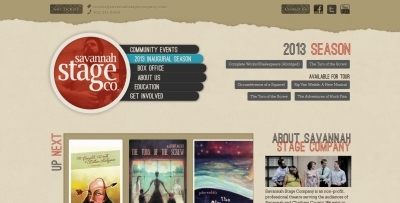 The result was a one-page site with a hint of Earthiness in texture and color. 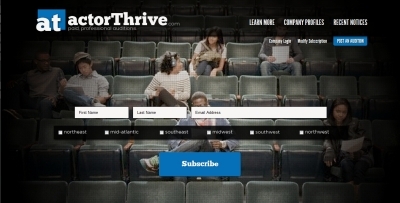 ActorThrive is a subscription service with the capacity to host tens of thousands of subscribers from across the nation. 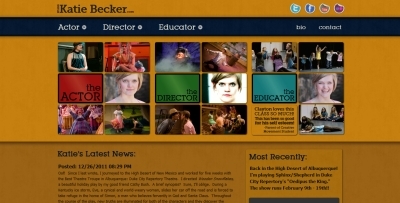 Credit for both the concept and design of this site go to Dramatis founder, Sean Michael Flattery. 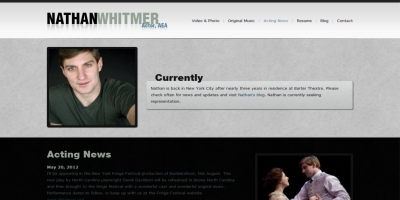 A prime example of how Dramatis blends its discoveries about what's most important in an actor's website with the style and character of the actor himself. 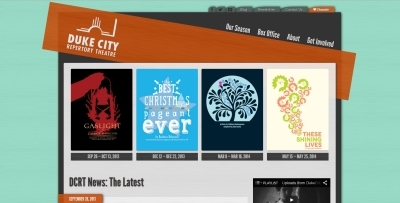 This project included a full rebranding from an earlier entity heavily known for its children's theatre. They wanted to erase that and go for a more classy but contemporary look and feel. No features were spared in this design--user registration, message board, music downloads library, Live RSS Feeds and a storefront. The focus here was on stripping away any superflous content and making the most important elements (contact info, professional status, etc.) appear on each page. 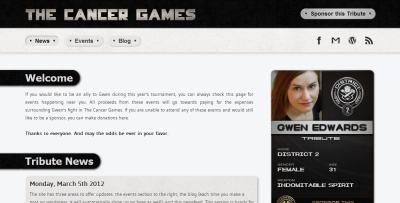 The Cancer Games contains client-managed news and event listings and uses PayPal for donations. Katie works regularly in three different disciplines and wanted each one to be cleary defined, so all three have a section of the site with their own mission statement, resume and photo gallery. 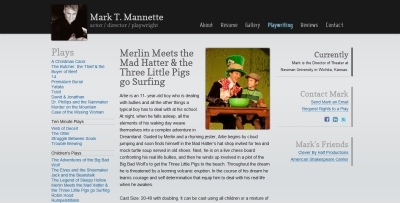 Hardy's site contains a lot of text, so a big focus was on carefully planning out the architecture of that textual content within each page to keep the styles dynamic, but consitent. 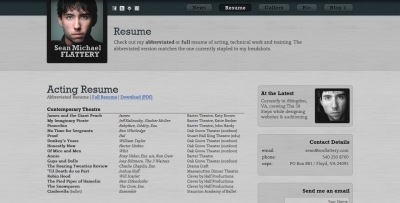 Mark's site had two primary challenges: a massive resume and a huge list of orignal plays (with descriptions for each). 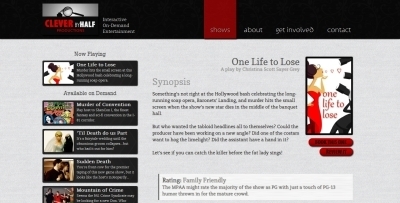 The resolution was to use blog-style formatting.